THE heyday of train travel in America may be over, but this Christmas season at least, there are plenty of special trains, trams, trolleys and steam engines — more than 70 special holiday rides on the rails nationwide. For the last three years, Lisa Carpenter of Ventura, Calif., and her son, Jayden, now 12, have chopped down their own Christmas tree and taken it home by train. They ride to the Santa Paula Christmas Tree Farm on the Fillmore & Western Railway’s Christmas Tree Holiday Train, which originates in Fillmore, a small town on Route 126, and winds between expansive ranches and citrus and avocado groves. Each year, the tree farm has different activities for kids, like a climbing wall or pony rides, and you’re apt to spot Santa on the outbound train as well. Fillmore & Western also offers children and adults a one-hour nighttime jaunt to the ”North Pole” and back to pick up Santa. Most of the children — and some adults — are in their pajamas. Then they get comfortable on board while chefs distribute cookies and chocolate milk and elves read ”Polar Express.” Back at the station there is time to take pictures with Santa, admire the 30-foot Christmas tree and ride a carousel. Dress warmly for the 35-minute steam-train ride at the Maine Narrow Gauge Railroad Company & Museum in Portland. These Christmas trains, which run from 4 to 7 p.m., take passengers along Casco Bay. The tracks are lighted with holiday decorations and displays of Santa Claus (whom you can also visit in person), but the real view is of the lights on the 38 islands in Casco Bay and on the waterfront, where you might glimpse workers unloading oil tankers. Trains leave often and can accommodate hundreds of passengers, so no reservations are necessary. The narrow-gauge railroad, which has a two-foot-wide track instead of the standard gauge of four feet eight and a half inches, originated in the Maine hinterlands in the late 19th century and was used to transport lumber from otherwise impassable areas. Some of the cars date to the 1890’s, and all the steam engines, powered by coal and wood, actually ran in Maine. If you ask, a conductor will allow you to go up front to see the stoker put coal in the engine. After the ride, you can warm up in the festively decorated museum with a hot chocolate and hobo cake, a pastry with fruit filling that was a favorite among the folks who rode the rails. At the National Capital Trolley Museum outside Colesville, Md., you’ll find Santa on the streetcars the first three weekends of December. The museum will be bringing out No. 1329, a 50-year-old tram purchased from The Hague. This bright yellow trolley will take children and adults on a 15-minute two-mile loop. Conductors are available to talk to children about the streetcars, and the museum itself will be free. YOU can enjoy Southern hospitality over lunch or dinner with Santa Claus at the Kentucky Railway Museum. It’s in the tiny town of New Haven (population 850) but owns 17 miles of track and welcomes more than 40,000 visitors each year. Once the whistle blows and the train gets rolling, meals with Santa are served in a 1940’s Tennessee Central dining car. It seats 48 people, but it usually sells out by Thanksgiving. The ride passes over two railroad bridges spanning the Rolling Fork River. Usually, the Crooked River Dinner Train in Redmond, Ore., chugs through the central Oregon countryside while performers stage shootouts, try to rob your train and otherwise take you back to the days of the Wild West. But this Christmas, the Crooked River is offering a three-hour mystery called ”Western Humbug,” based on ”A Christmas Carol.” Enjoy a four-course holiday meal as you roll along and prepare to search for clues when a gunshot disrupts your dinner, as it surely will. CALIFORNIA — Fillmore & Western Railway Company, Fillmore, (800) 773-8724;www.fwry.com. 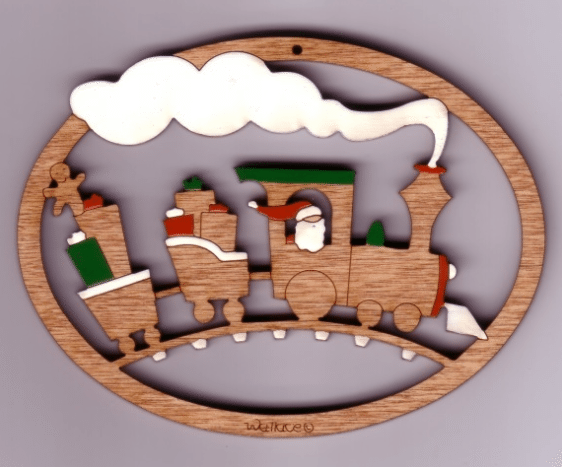 What: Christmas Tree Holiday Train and North Pole Express. Dates: First three weekends in December for the Christmas tree train; Wednesday to Sunday through Dec. 23 for North Pole Express. Cost: $20 for the Christmas tree train and $22 for the North Pole Express for adults; less for children. KENTUCKY — Kentucky Railway Museum, New Haven, (800) 272-0152; www.kyrail.org. What: The Santa Express, Lunch with Santa, Evening with Santa. Dates: First three weekends of December. MAINE — The Maine Narrow Gauge Railroad Company & Museum, Portland, (207) 828-0814; www.mngrr.org. Dates: Weekends and other days through Dec. 23. Cost: $8 for adults, $5 for children 3 to 12 (2 and under ride free). MARYLAND — National Capital Trolley Museum, Colesville, (301) 384-6088; www.dctrolley.org. Dates: First three weekends of December.. Cost: $3 for adults; less for children. OREGON — Crooked River Dinner Train, Redmond, (541) 548-8630; www.crookedriverrailroad.com. Dates: Dec. 2, 3, 9, 10, 11, 16 and 17. Cost: $78 for adults; less for children.